Discounts, discounts, discounts!!! 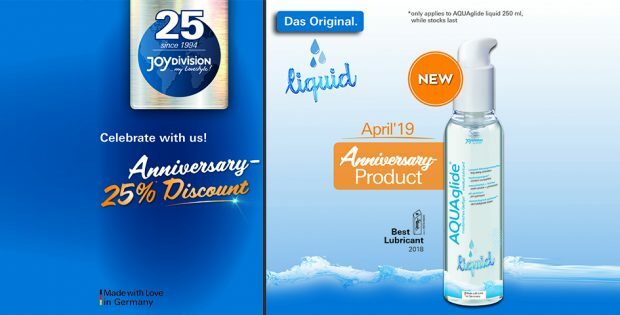 In April retailers can look forward to AQUAglide liquid 250 ml. For the demanding lovers, JOYDIVISIONS want to try out the special kick in their love play, the millionfold popular AQUAglide – in completely new consistency – for even more fun together, is now available. AQUAglide liquid creates a waterfall of emotions. The liquid consistency is surprisingly different, yet combines all the properties of a lubricant and is very easy to use. Thanks to the new feeling, the special formula of AQUAglide liquid invites you to play. The lubricant produced “Made with Love in Germany” is available in 125 ml and 250 ml bottles with a practical dispenser pump and thus enables easy dosage. AQUAglide liquid is naturally water-soluble, fat-free and suitable for condoms. Dermatological tests guarantee a particularly high skin friendliness. For all retailers it means now again: Access while stocks last. Simply send your order to sales@JOYDIVISION.de. The offer for AQUAglide liquid 250 ml is valid for incoming orders from 01 April 2019 to 30 April 2019. Further attractive promotions will follow monthly.